Michelle and Travis met the new-fashioned way – at a speed-dating event! While they wanted a sprinkling of tradition, mostly they wanted their wedding to reflect their modern love story. 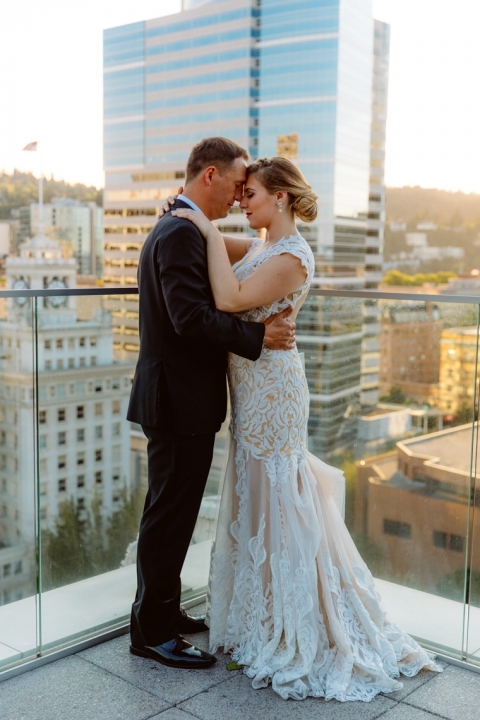 The wedding and reception took place at the Nines Hotel in downtown Portland on a perfect September evening. The bride and groom wanted to feel like they were outdoors inside the ballrooms, so we brought the outside in, achieving the desired effects with creative lighting, draping, foliage and floral placement. The orange flower used in the floral arrangements was the same bloom Travis gave to Michelle on their first date. 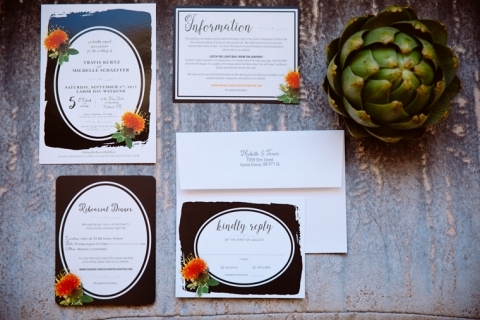 The vibrant orange and rich chocolate browns were used throughout the printing for the occasion – invitations, signs, menus and custom “Do Not Disturb” hotel door placards. Melissa Coe officiated the light-hearted and sentimental ceremony. Even the couples’ dogs took part in the festivities – their fur children adorned with floral collars. And no modern wedding is complete without a Flash Mob during your first dance! PDX Flash Mob choreographed the scene at the couple’s request and brought the house down! 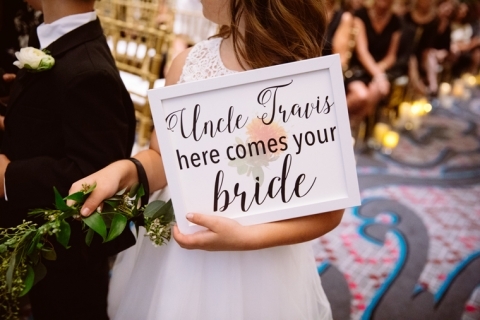 All the unique and personal touches made for an intimate and thoroughly “Michelle and Travis” affair, captured beautifully by Jessica Hill Photography. The meaningful vibrant orange pop tied all the details together. 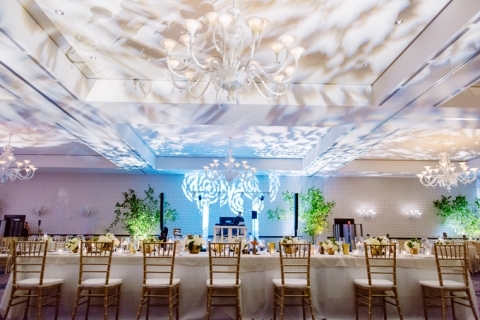 Bringing the outdoors into The Nines’ ballrooms. The dazzling bridal party and the wedding party out in Pioneer Square celebrating the marriage. The fabulous PDX Flash Mob first dance! © 2019 BLC Events|ProPhoto 6|Design + Dev by Northfolk & Co.